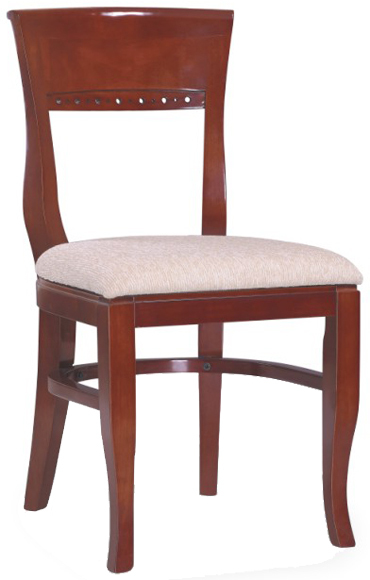 Dimensions: 18 1/2" W x 34 3/4" H x 20 1/2" D; Seat Height: 18"
Seating Masters' Premium Beidermeir Chair features timeless and elegant beauty that is sure to bring an air of grace to any venue. In addition to its beauty and durability, Seating Masters' Beidermeir Chair can be customized to best fit your venue by choosing from a number of different options. It is available in an array of wood finishes and comes standard with a solid saddle seat and nylon glides. Our saddle seat is comprised of solid wood rather than the cheap plywood employed by the competition. The chair is also available with a padded seat in a variety of vinyl and fabric upholstery options. Pair this chair with Seating Masters' matching Beidermeir Wood Bar Stool to give your establishment the cohesive look you desire.